Just the Shirt from Eileen's Design Studio. I am sure it is out of print. The was another shop sample. It is made from a Malaysian print and the lining is an African blue brocade. Bright and cheery. The shirt is a Medium, roomy. 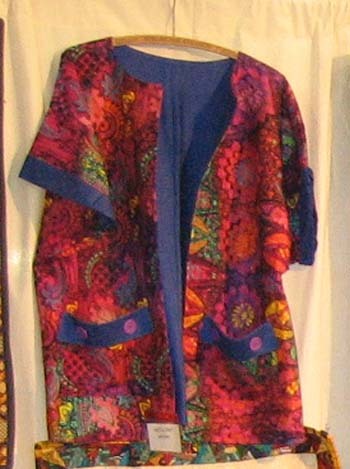 The Malaysian print was from Bold Over Batiks. 2.5 yards were used. The Malaysian print alone sold for $47.50. I think it make a really great over blouse. The picture was taken during one of our many quilt shows, in our booth.